1921 Walking Liberty Half Dollar MS65 PCGS The three 1921 Walking Liberty half dollars, Philadelphia, Denver, and San Francisco, are the classic key-date issues for this series. While the 1921-S is rarest in high grades, the 1921 and 1921-D issues had the two lowest mintages in the series at 246,000 and 208,000, respectively. While the PCGS population data suggests that some other issues are more elusive in MS65 or finer grades, the 1921 figures are likely inflated due to a higher number of resubmissions. This particular example offers glowing luster, delicate patina and atypically clean surfaces. 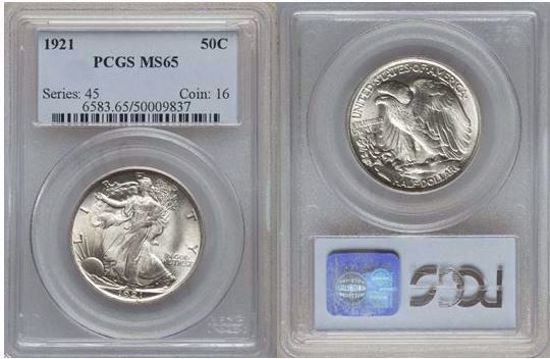 Only 13 have been graded higher by PCGS, 8 of which are MS65+. Listed at $21,800 in the CDN CPG, $23,500 in the PCGS price guide and $23,000 in Trends.